The Dust-Tex mop was designed by people who know and understand dust control. It is an engineered cleaning tool that does more – and does it better – than any other dust mop. Five separate rows of yarn keep maximum yarn in contact with the floor for better dust pickup. 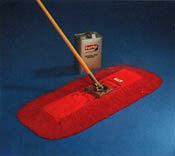 Variable length fringe gives the mop extra capability for dusting and polishing: long lengths on the outside sweep debris; shorter inside rows help clean the floor while absorbing maximum amounts of dust and dirt; short center fringe contributes a polishing effect, leaving floors clean and dust free. The treatment is paraffin-based to provide the viscosity and aggressive dust-holding properties essential for maximum dust pickup. A special emulsifier prevents the mop from creating an “oil slick” when moisture is encountered on the floor. Dust-Tex treatment is UL listed, contains an EPA registered bacteriostat and provides every mop with a pleasing, fresh lemon scent.